Minford’s Caitlyn Puckett has played an imperative role in this year’s success. 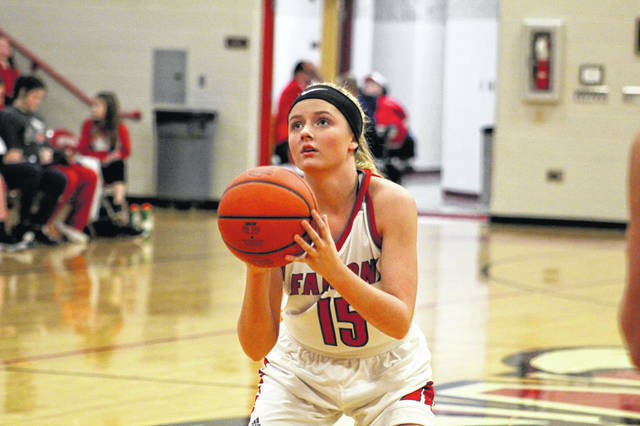 Minford’s Livi Shonkwiler says her confidence level has risen since the beginning of the season, allowing her to become a viable scoring option for the Falcons. Minford’s Maddie Slusher rubs the shoulders of teammate Hannah Tolle before a game earlier this season at Minford High School. The Falcons’ sense of unity has been a key factor in the team’s success. 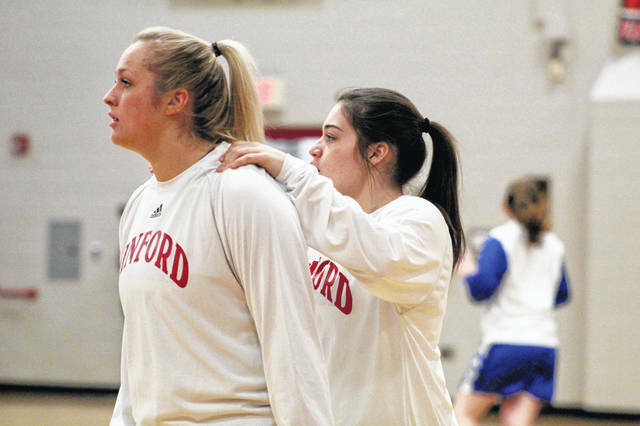 MINFORD — Before Minford’s girls hosted Washington Court House less than two weeks ago, during warm-ups, junior Maddie Slusher put both of her hands on junior Hannah Tolle’s shoulders and started nonchalantly massaging them. It wasn’t a monumental moment and, more probable than not, Slusher didn’t even know anybody was watching. But it was a moment that perfectly painted a picture of the relationship that each of Minford’s roster members have with one another. The Falcons, who currently stand at 13-5, have taken their lumps this season. But those lumps haven’t come due to lack of effort. Quite frankly, Minford’s regular season schedule is nothing short of brutal … featuring opponents like Washington Court House, Miami Trace, Waterford, Jackson, Fairland, Russell (Ky.) … you get the point. And, to drive the point home, that doesn’t include conference opponents like Wheelersburg, Oak Hill, Waverly, South Webster and so on. So to have won 13 of 18 games facing a schedule like they have? Well, that’s a feat that oozes success. 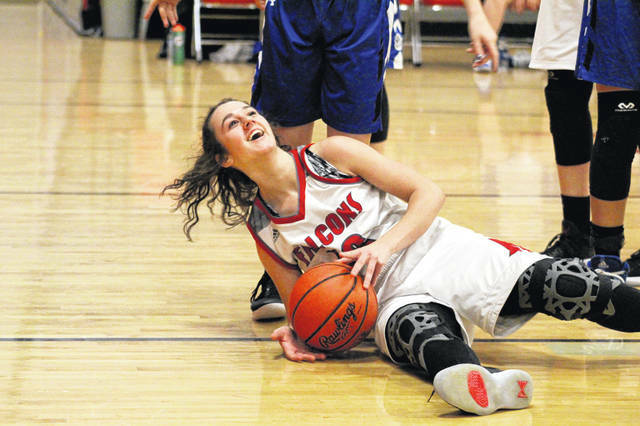 On Jan. 14 and 17, the Falcons lost back-to-back games to Miami Trace and Oak Hill. But they immediately bounced back with back-to-back wins over Coal Grove and Valley. Sophomore Livi Shonkwiler has the answer … and it’s a simple one. Shonkwiler has transformed into one the team’s most viable scoring options. But that wasn’t the case when the season started. Senior Ashley Blankenship entered the year with confidence. She was the unquestioned leader coming in and has proven her worth time and time again. Earlier this season, Blankenship scored her 1,000th career point … to nobody’s surprise. But it’s not just her talent that impresses. It’s her value as a teammate that takes the cake. Slusher could say the same about herself, but would never do so. Her humble demeanor off the court doesn’t embody her up-in-your-face style of defensive prowess between the lines. Left on Minford’s schedule are conference dates with Waverly, South Webster and Northwest, as well as non-conference bouts with Russell (Ky.) and Fairland. But with players like Shonkwiler, Tolle, Blankenship, Slusher and Caitlyn Puckett leading the way, as well as a more than capable first-year head coach in Davis, the Falcons have more success — and hopefully a lengthy tournament run — in their near future.